Operations 360 has been involved in Training & Consultancy since 2010 with the special focus on Supply Chain, Project Management, Process Improvement, LEAN Production Systems & Business Excellence. Having trained 1000+ mid and senior level executives in SMEs, Multinationals, Development Sector and Government, we have extensive experience in delivering solutions that are required to solve the most pertinent problems faced by the industry. "Our trainings have prepared multitude of professionals to become globally recognized certified professionals"
Supply chain is seen as a strategic asset. The post-recession global marketplace recognizes supply chain management as a key driver of business success and viability. Supply chain management is a well-established role in industries beyond manufacturing, including retail, health care and technology. Supply chain and operations management jobs are in demand. 200,000 U.S. supply chain jobs will go unfilled annually until 2018 for lack of qualified talent. APICS (formerly American Production & Inventory Control Society and now Association for Operations Management) is the world’s foremost body for the standardization and propagation of supply chain management and related field. They offer several certifications for industry professionals and CSCP is one of them. Recently Supply Chain Council (SCC) & American Association for Transport & Logistics (ASTL) have also merged with APICS, making it even more comprehensive and affective. Many professionals have Supply chain management experience but do not have the credentials to verify this fact. The credential can be in the form of a degree or a professional certification. CSCP is the premiere certification for professionals around the world administered by APICS. This is no ordinary local certification. This is recognized globally. Just search the Internet about CSCP and see its popularity and demand. CSCP holders easily get better salaries (20-25% increase) then their non certified contemporaries. All over the world including USA, Middle East, Europe, Singapore and even in Pakistan, the requirement for CSCP is becoming a must for mid level and senior level jobs. This workshop is the first step towards becoming a certified CSCP. The second step is testing and preparation using the online testing offered by OPERATIONS360. The last step is to appear for the exam in any PEARSON VUE center around the world (3 centers in Pakistan). PLUS additional information that others do not cover. Many other consultants / training organizations offer CSCP workshops ranging from 5 days (40hrs) to 4 months (96hrs). Some being too short, some being too long to retain attention. This workshop has been designed very carefully keeping in mind the time availability of participants and effective preparation for the exam. While these workshops claim to prepare the candidate for the exam, truth cannot be further from the reality. Any workshop including ours is only useful in creating the foundation for the candidate. The next step is extensive practice that requires discipline and time. This is where others fail and we take off. Our custom designed exam simulator by Operations360 gives our candidates the extra punch needed to appear in the certification exam. After careful research we have come to the conclusion that most CSCP training workshops don’t result in the candidate appearing for the certification exam. They don’t feel confident enough. We found out the reason and now our 2-step program is going to effectively address this problem. We don’t just preach innovation we practice it as well. Will I get a CSCP certification after the workshop? You will get a certificate by OPERATIONS360 that you have completed the training for CSCP certification. In order to get certified CSCP credential you have to appear in a three and half hours test. What is the CSCP test about? It is a Multiple Choice Questions MCQ based exam with 150 questions (130 operational and 20 pretest) to be attempted in three and half hours. Pretest questions do not contribute to the total score and are distributed randomly amongst the other questions. These are added for research purposes. This exam is held at PEARSON VUE testing centers around the world. The result is available immediately after the exam. What are the pre-requisites for CSCP certification? 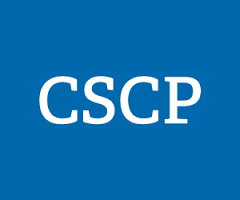 What is the CSCP certification exam fee? The fee for the exam is US$ 1,050 (members) or US$ 1,300 (non-members) payable to APICS USA. In case you fail to qualify in the first exam the fee for exam retake is US$ 450. A student can become a member of APICS USA for free, while a professional can become a member for US$ 200. If you are enrolled in an evening program such as MS or PhD, you can avail student membership, which means a saving towards the certification. I have heard CSCP certified individuals need to get re certified every few years? This is too much effort. These are easy to accumulate and send to APICS for renewal of CSCP credentials. This way APICS ensures quality.